Veteran journalist and Arutz Sheva host Walter Bingham awarded the Legion d’Honneur for his role in the invasion of Normandy. The French government, through its ambassador to Israel Hélène Le Gal, on Thursday awarded the Legion d’Honneur, the highest French decoration for military and civilian accomplishments, to an Israeli citizen for the first time. The first Israeli to win this award was veteran journalist Walter Bingham, 94, who hosts a weekly radio program on Arutz Sheva. Bingham, born in Germany, was part of a group of British fighters whom France wanted to honor for their part in the liberation of France during World War II. He served as a driver in the British army and took part in the invasion of Normandy in 1944. In 2004, in honor of the 60th anniversary of the liberation of France, the Government of the French Republic decided to honor foreign former fighters who were still alive and who participated in the invasion of Normandy in June of 1944, in order to express gratitude to those who liberated France. 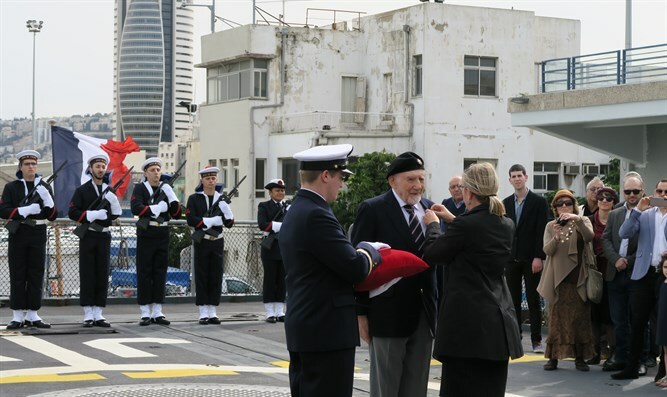 Thursday’s official ceremony took place on board the French warship Jean de Vienne which anchored in Haifa especially for the occasion. "It is a great honor for me to receive the highest decoration that France provides. I accept it not only on behalf of myself but on behalf of all the fighters who were by my side at that time and who unfortunately are not with us today," Bingham said after the festive ceremony. This is the second award that Walter Bingham has received for his participation in the invasion of Normandy. In the past he has received similar recognition from Britain.